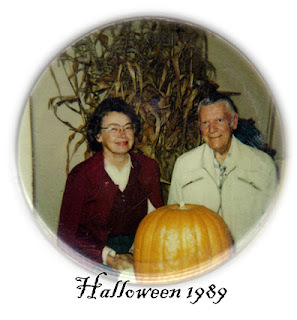 November is a month for many things, including Thanksgiving, birthdays for two sisters, and a writing challenge where you post some writing every day during the month. It's called Nanowrimo and the idea is to encourage writers to write a novel. Since I'm a blogger but have no intention of writing a novel, I'm going to just write. I'm going to attempt a daily post...no promises, but the theme will be Food Memories. Hope you'll journey down the remembrance road with me. The photo is from October, but today is the next day, All Saints Day in the Christian world, so that's OK. The photo was taken one year when Mom and Dad visited us via train. Somehow we messed up the time and arrived at the station an hour late for their planned departure so they stayed an extra day...Halloween...and left on Nov. 1. Although I don't bake nearly as much as I used to (which Sweetie appreciates as he continues to drop pounds through healthy eating and extra exercise), this started out, pretty much, as a baking blog. I love to bake. It's one of my favorite hobbies. When I was young it was the first cooking I did, except for making sandwiches and that kind of thing. My Mom didn't share her kitchen well and she was upfront about that. A big part of that was that it was a small kitchen. Having eight kids to get underfoot didn't help, either. Being allowed to be in the kitchen baking cookies or a birthday cake was a treat. She was pretty patient with helping at first, but expected me to learn quickly (which, fortunately, I did) and to learn through reading package instructions and recipes in cookbooks along with her instructions. Because I started that way, I usually can do a quick read-through of a recipe and know if it will be easy or difficult, about how long it will take, and I can often imagine how it will taste and come pretty close if not spot on. 60 or more years of experience really helps, but I remember when I was in my early 20s and I had to make a dessert for a dinner party with my in-laws (first husband). My friends were shocked when I made a cake that was a brand new recipe and that I changed a few things about the recipe even though I'd never made it. "Aren't you worried that it won't turn out? ", they asked. I never did worry about that because my baked goods almost always were delicious and even those that didn't meet my expectations were still good enough for company. I sound smug...sorry...but it is a talent I was born with and nurtured, so I can be proud of it. 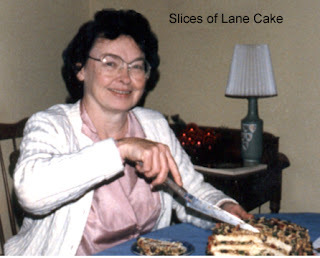 My Mom baked lots of delicious things, including her famous apple pie, warm and buttery biscuits, great cornbread in a skillet, delicious cakes and cookies and special desserts for Christmas like Lane Cake and crescent cookies. She made Parker House rolls on special occasions, but she left the major bread baking to my Dad. Dad grew up in a number of places, mostly in the South, but often in farming communities or places with farms nearby. He loved fresh produce and had a garden until too much shade from the maple trees made it impossible. I suspect that helping to raise so many children and his job also got in the way. In my late teens I think that things became a little easier because he started baking bread every Sunday after church. I wish now that I had helped him, but I was too chatty. The bread baking time was his time for quiet and usually no one else was in the kitchen. Since we had a large family with plenty of sandwiches being made for lunches, he baked a lot of bread every week. I think it was eight loaves. Although it wasn't artisan bread, it was far better than the tasteless balloon bread that was pretty much all you could find in the grocery stores. 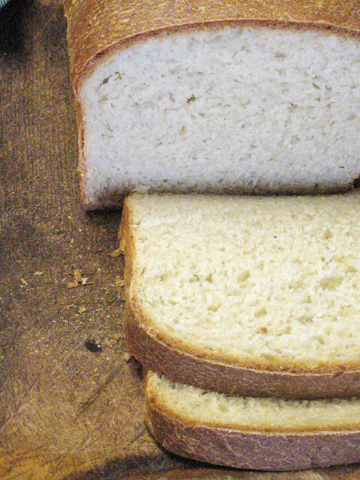 I remember it as white loaves with a good top crust, golden sides, and a nice even crumb, plus a delicious taste, especially toasted. 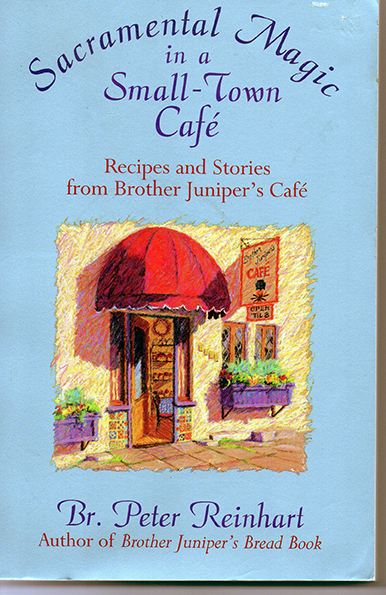 After moving to the North Bay, I discovered Brother Juniper (Peter Reinhart) and his artisan breads, I sent my Dad a copy of his book Sacramental Magic in a Small Town Cafe, in which Peter tells about how he and his wife Susan ran a cafe and baked bread for it to help support a Christian service community's retreat center. It included recipes for some of his famous breads like Struan, Wild Rice and Onion, and a great plain loaf, too. I think my Dad tried out the technique of retarding the dough to increase the flavor and said that his bread was even better. By that time (mid to late 1980s) Dad only needed to bake a couple of loaves a week because the children had grown up and most had moved away. Still, when I bake bread loaves in a loaf pan I always think fondly of my Dad and his Sunday bread baking. Sprinkle dry yeast or crumble cake yeast into the water. Let stand a few minutes to proof (mixture gets bubbly), then stir until dissolved. Pour hot milk over butter, sugar and salt in a large mixing bowl. Let cool to room temperature. Add yeast mixture and 3 cups of flour. Beat well. Add remaining flour and mix well. If needed, add additional flour, a tablespoon at a time, until dough pulls off spoon cleanly. Put into a greased or oiled bowl, turn once, cover with a clean shower cap and let rise in a warm place until double in bulk (about 1½ hours or until, when top is pressed, a dent remains). Punch down. Let rise for 30 minutes. Shape into two loaves by rolling each half of the dough out into a 11” x 15” rectangle. Starting at the narrow edge, roll up as for a jelly roll. Seal ends and fold under 1” at each end. Put in greased bread pans (9” x 5” x 3 “). Let rise until doubled, about 45 minutes. Brush risen loaves with beaten egg for a shiny crust or with butter or milk for a soft crust. Bake in preheated 4000 F oven for about 35 minutes. Remove from oven and cool on rack. Loaf will sound hollow when tapped on the bottom if done. Slice when cooled. Makes 2 loaves.